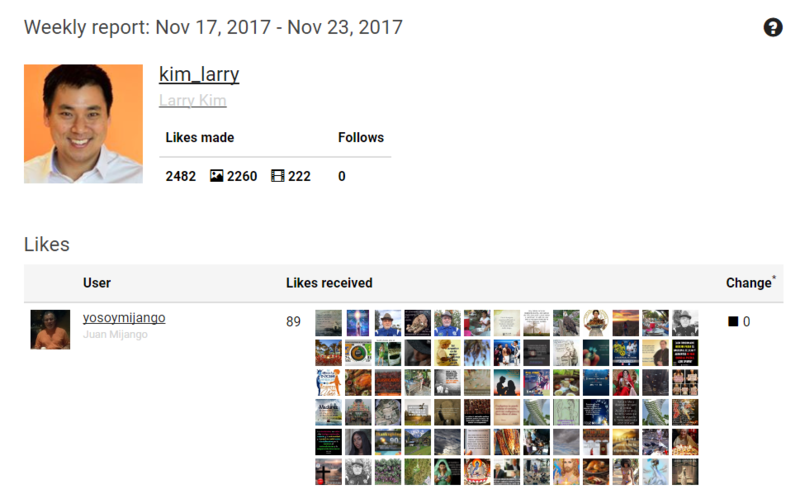 If you’re using Instagram and you want to get more and more followers every day, you’re probably interested in how the popular accounts growth strategies work. We already described two main methods: organic and automated and shared the perfect way to define which one is used by a certain Instagram user: you need to monitor its activity within 2-3 weeks with Snoopreport and then compare the data with the common user behavior on Instagram. For more details, click here. So as you can see it’s pretty easy to check if a person uses Instagram automation to grow the followers count. But the Snoopreport tool provides more in-depth metrics to prove the research results and get all details of the growth strategy applied. Let’s consider the mass liking method first and discover the automation settings. Have a look at the weekly report with 2482 likes made. 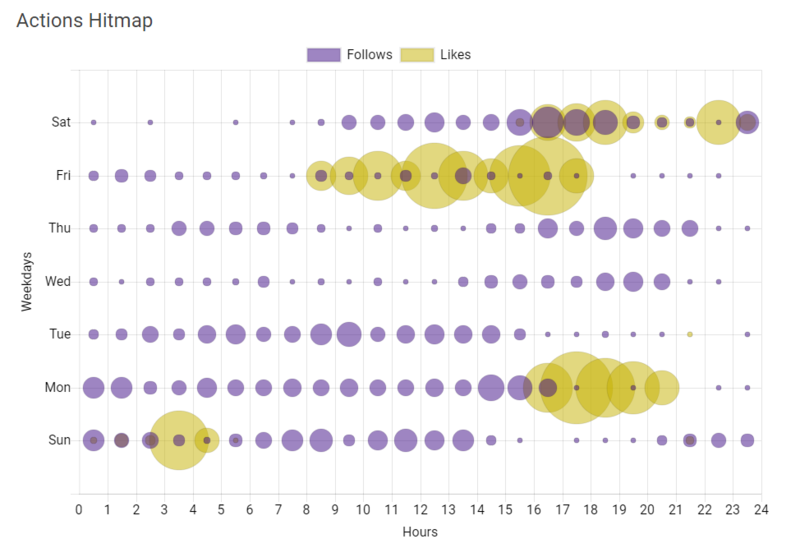 Of course, this data is much higher than the common user’s one which is about 50-500 likes a week. But to be completely sure let’s analyze the Actions Hitmap provided in the report. This figure shows activity 24/7 and peak and low hours so you can estimate target time zone (time set in PST) that is probably west coast. Another important feature of the report is liked media tags cloud. It allows you to see all the liked posts hashtags and among them those that are more frequently used (they have a bigger font size and brighter color). So as it’s obvious that the mass liking was applied in this case and you can estimate hashtags the user used to target the media: SEO, socialmedia, contentmarketing, socialmediatips, business and so on. Now you have his complete bot-driven Instagram growth strategy discovered. But there is one more approach related to Instagram automation called follow-to-follow. In this case Instagram bots follow other users from your behalf and it’s expected that these users will follow your account back. As you can see the number of follows is huge here within just one week when the usual Instagram activity is supposed to have about 20-30 follows. 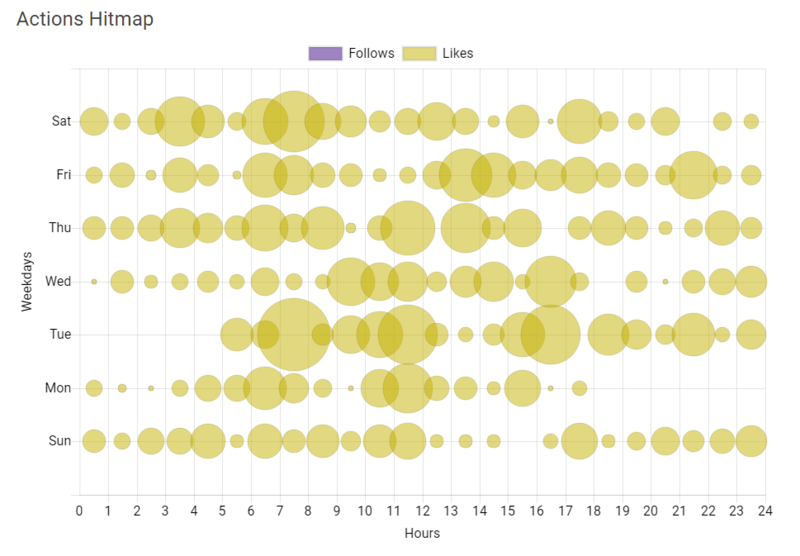 You can see an equal number of follows distribution and the user continues to follow others 24/7 ? It means activity is 100% automated and more that that evenly distributed to avoid bans. After the understanding of other users growth strategies, you can make up your mind about your own and perhaps borrow some tricks.